With shipments of stone fruit coming to an end from Chile, and getting ready to start up from California, now may be a good time to mention a commonly found defect of apricots, but many times overlooked. As with all stone fruit, skin breaks can be a serious defect. But with apricots, because the fruit is soft and the skin is susceptible to skin breaks and abrasions, the defect is frequently encountered. The image above depicts a skin break in the stem basin, most likely occurring when the fruit was picked. Even though this break covers a large area, it is considered as being a healed skin break. The flesh is dry, with no juice exuding from the break. 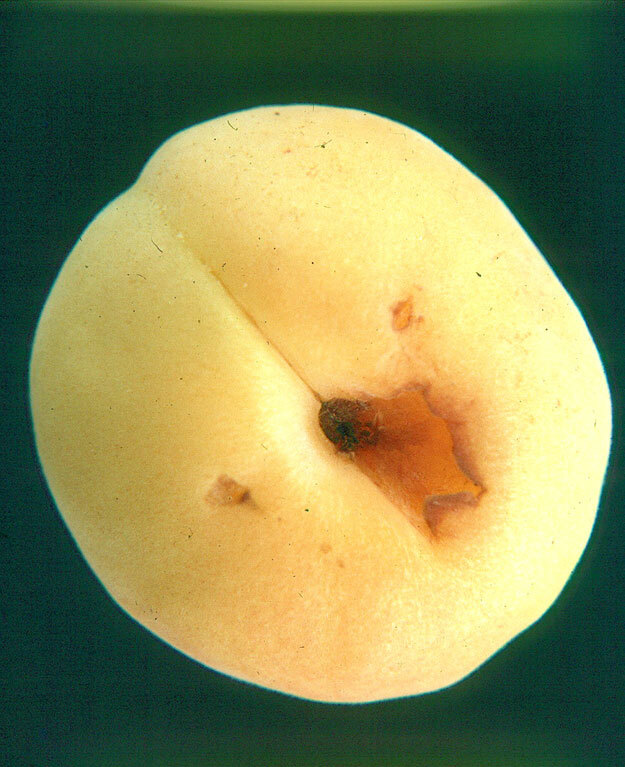 Regardless of the location of the skin break, or if the skin break is fresh or healed, this defect for apricots is a “free from” defect, and is always scored against the tolerance for serious damage. Remember, “free from” means any skin break, regardless of the size of the break, even those resulting from stem punctures, from adjoining apricots. Even if the apricot only had one small skin break, like the ones affecting the shoulder, the apricot would still be scored as serious damage defect. The tolerances for apricots are: 10% tolerance for defects, including not more that 5% for serious damage, including not more than 1% for decay. If you encounter skin breaks on apricots, the U.S. Grade Standard only allows 5%. For example, if your sample size is 50 apricots, and you find 3 apricots with skin breaks or punctures, you would have 6% serious damage, exceeding the 5% tolerance allowed for serious damage defects. If you are wondering why the grade standard is so restrictive, it is because any type of skin break is an entry point for decay. Molds, such as Blue Mold Rot and Gray Mold Rot can easily infect an apricot with a skin break.